Blue Allen appears to be an easy-going guy. The kind of guy who's always there when you need a hand. The guy who will volunteer to check bits or work the cattle pen at a show. But don't you believe it. 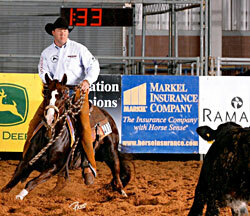 When it comes to training cow horses, the man is passionate and intense. Some might even call him obsessed. Whatever it is, in 6 years it has driven him from riding colts for local ranchers and neighbors to a Reserve World Champion on a horse named Whiskey Starlight. That was in 2007 in Stephenville, TX. 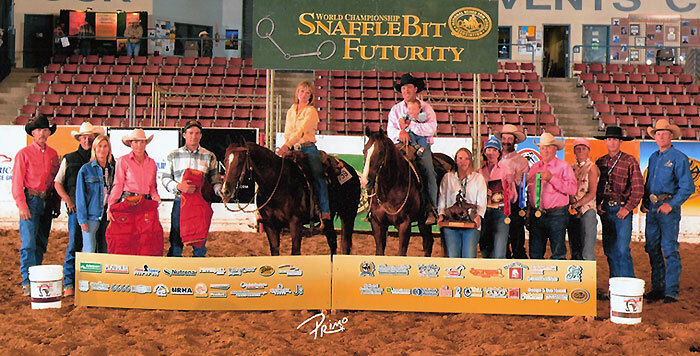 The following year was a big one for Blue at the Futurity in Reno: He made the Ltd. Open Futurity Finals on Mister Kat, won the Ltd. Open Bridle on Chex Peppy Pistol and was Reserve Ltd. Open champion on Whiskey Starlight. In 2009 he was once again a World Champion in San Angelo, on Chex Peppy Pistol in the Ltd. Open Bridle and Reserve Champion on Double R Wrightway. That's a resume any competitor would be proud of, but it wasn't the magical meteoric rise it appears to be. Nor was it one that Blue had a definitive plan for when he started out. He just knew he wanted to be around horses. After graduating from Colorado State University with a degree in animal science, the first in his family to get a college degree, Blue headed off to Walden, CO, to be a cowboy. 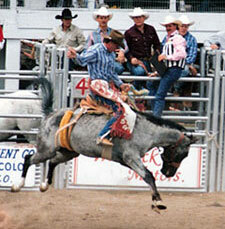 Until then his "show" career consisted of team roping and saddle bronc riding in rodeos. In Walden, he worked for the Williams Livestock Co. which raised Angus cattle and broodmares. When that owner sold out and moved to California, Blue who by then had married his college sweetheart, Jeannie, headed to California, and continued to work as a cowboy. 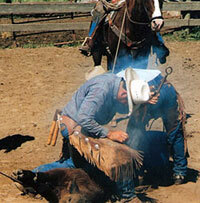 Then he had the opportunity to start colts for NRCHA Hall of Famer Stan Fonsen. He learned a lot from Stan about cow horse training, but apparently didn't listen to one of Stan's most important pieces of advice: "I tell everybody not to do what I did," Stan has said. " I jumped out on my own, didn't work for anybody, didn't apprentice for anybody. I said if I had just spent a minimum of one year with somebody it would have been much easier instead of trying to learn through trial and error and picking up information from this guy and that guy. That's why I tell everyone that's worked for me to not go out on your own too soon." But Blue got a call from his home town of Alamosa that a rancher he and his family had known for years was selling out and he offered Blue a deal he couldn't turn down. The owner was even willing to carry the financing. So Blue and Jeannie headed back to Alamosa to a 160-acre ranch that needed a lot of work – it didn't even have a decent riding arena. But at 25, what cowboy could turn it down? Still, it meant he wouldn't be working and learning from someone else. By then Blue was consumed with trying to pursue cowhorse training. "It's the ultimate sport. The horse has to be good at everything," he says. But who was going to bring a young cowboy a horse to train and show? Fortunately a neighbor for whom he had been riding colts decided he'd like to get into cowhorse too, with Blue as trainer and rider. They found a futurity horse in Santa Fe – Chix Dig Him – and they were off. That year Blue hit Reno for the first time. It was 2003, Blue was 27 years old and so far he had been to 3 horse shows. This would make 4. "It was awful," Blue says. "I was 33rd in the herd and the reining and fence work were even worse." Feeling defeated but not undaunted, Blue returned home. "I didn't have the kind of facility I needed. I didn't even know about what kind of dirt an arena should have. I got some help from some cutters that I knew, but of course they didn't go down the fence. So I only went down the fence at shows." Another horse came along, Julie Be Smart, and Blue started winning – a little. About that time Versatility Ranch Horse was getting started and Blue paid some of the bills by doing Versatility clinics and taking whatever else came along to work or train. It was 2006 before he came upon a horse that finally put him in the chase. 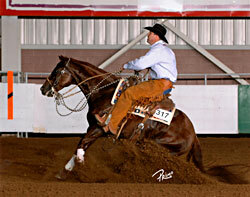 LM Typical Shadow was one of the last horses to go in a sale at Jim Mapes ranch in southeastern Colorado. It started hailing, most of the people had already bought something, and the crowd bailed. That gave Blue and Jeannie the chance to buy a talented horse for only $1,200. "That horse could have taken me down the fence without a bridle," Blue recalls. But at Reno he missed the finals by 2 slots. It was a huge disappointment. Fortunately another client brought him his next Futurity prospect, Mister Kat and then others followed with horses that have put him in the winners spotlight. "I've been very lucky with clients who have brought me the kind of horses that were meant to be winners," he says. Now, like every other trainer, Blue fantasizes about having 8 fabulous horses that could take him to the next level. 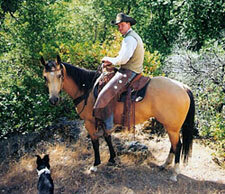 In the meantime he spends long days in the saddle doing his best with what comes his way.